Sam Cerruti Custom Tailors - Custom Tailored Women Trousers & Bespoke Pants Trousers play a major role to play in one’s wardrobe. Though they seem easy to buy for men, but the selection with women’s trousers is the trickiest task if one wants to carry a fabulous look with a single purchase. While exploring the market, you may find every second pattern going in contrast with the first and every third one in sync with fifth one, but actually, there are slight and minute differences that work as deciding factors for the fitting they hand over.Where a smart and intelligent selection helps you to get a stylish look in your trouser, a wrong selection will ruin your overall look and appeal. Here we have few points mentioned that if considered will help you to add quality collection to your wardrobe.Women’s trousers are usually first measured and then manufactured so as to make sure that they fit perfectly. But as usual, getting the right fit is not as easy as it seems.Today, with the availability of many branded stores, shipping for the perfect size of ladies trousers is not that daunting. But this is when a woman is sure about what her actual measurements are and is able to identify the comfort level that allows her to wear and carry her trousers in the best way. In theory, women generally have various standard clothing sizes that are set as universal sizes and one or the other is bound to fit them perfectly. They vary from one place to another, and one has to make the right choice on what will be best for her.There are various fits among ladies trousers, namely slim leg, boot cuts, wide leg, kick flare, straight leg, wide leg and cropped leg or Capri fit. These are some most commonly sold styles and patterns of fashion trousers as the modern manufacturers have been able to sense the pulse of today’s youth.While purchasing fashion trousers, it is important to take your measurements first. Even if you know your size ask the salesman to take the measurement. This will give you an idea as to which size of designer trousers will fit you perfectly. You should also check that the measurements taken are apt so as to avoid any sort of mistake in your purchase.Also, for obese women, designer trousers in plus sizes is a bonus to buy and look great. Trousers have designs that make them look curvier, slimmer and sexier masking all the imperfections from their hip line to toes, but the best solution is to go for bespoke or custom trousers. 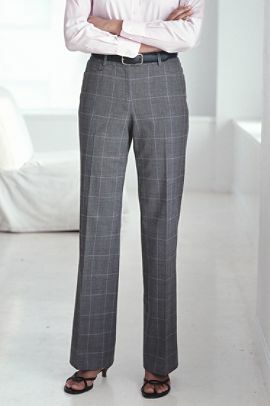 Trousers play a major role to play in one’s wardrobe. Though they seem easy to buy for men, but the selection with women’s trousers is the trickiest task if one wants to carry a fabulous look with a single purchase. While exploring the market, you may find every second pattern going in contrast with the first and every third one in sync with fifth one, but actually, there are slight and minute differences that work as deciding factors for the fitting they hand over. Where a smart and intelligent selection helps you to get a stylish look in your trouser, a wrong selection will ruin your overall look and appeal. Here we have few points mentioned that if considered will help you to add quality collection to your wardrobe. 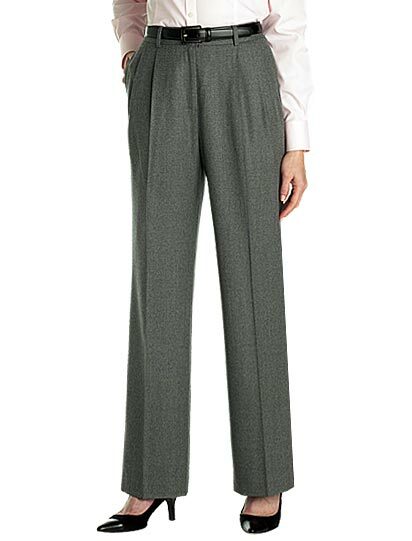 Women’s trousers are usually first measured and then manufactured so as to make sure that they fit perfectly. But as usual, getting the right fit is not as easy as it seems. Today, with the availability of many branded stores, shipping for the perfect size of ladies trousers is not that daunting. But this is when a woman is sure about what her actual measurements are and is able to identify the comfort level that allows her to wear and carry her trousers in the best way. In theory, women generally have various standard clothing sizes that are set as universal sizes and one or the other is bound to fit them perfectly. They vary from one place to another, and one has to make the right choice on what will be best for her. There are various fits among ladies trousers, namely slim leg, boot cuts, wide leg, kick flare, straight leg, wide leg and cropped leg or Capri fit. These are some most commonly sold styles and patterns of fashion trousers as the modern manufacturers have been able to sense the pulse of today’s youth. While purchasing fashion trousers, it is important to take your measurements first. Even if you know your size ask the salesman to take the measurement. This will give you an idea as to which size of designer trousers will fit you perfectly. You should also check that the measurements taken are apt so as to avoid any sort of mistake in your purchase. Also, for obese women, designer trousers in plus sizes is a bonus to buy and look great. Trousers have designs that make them look curvier, slimmer and sexier masking all the imperfections from their hip line to toes, but the best solution is to go for bespoke or custom trousers. 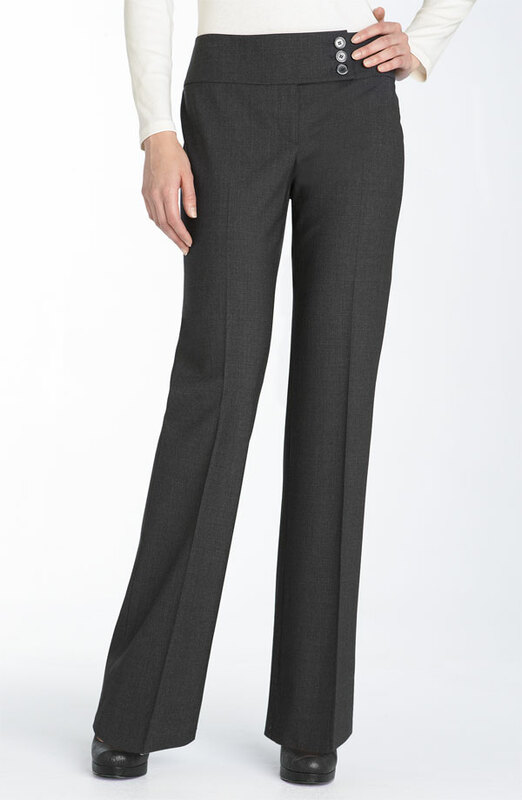 The pant suits are proven best partners for your journey from home to office till the boardrooms. A pantsuit or pant suit, also known as a trouser suit, is a woman's suit of clothing made of trousers and a matching or coordinating coat or jacket. 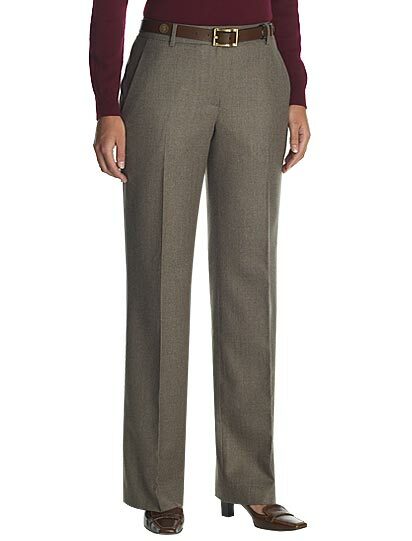 For a professional look and a good impression, pant suits are the best choice. It is important to buy a pant suit that will fit you well. The fit of a pant suit is just as important as the pant suit itself, and our custom pant suits are made totally risk free.pant suits have always been much in demand and attracted women of all professions. Your pant suit makes you look a very professional; hence the fit of pant suit must never be neglected, to maintain the professionalism. In our online store you find all four styles of lapel, so you have every reason to choose your own style. From the styles of waist band for the pant you can select one out of five options. For a more formal look you can choose waist band of medium and narrow size. Or to make it casual you have band without loop. 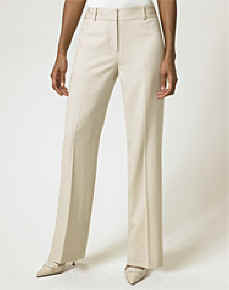 For the pleats of pant you have all three choices of plain front, single pleat & double pleat. And as per your need of a formal or casual look, we offer you 4 styles of side pockets and 5 styles of back pockets. For the coat or jacket of your pant suit, SAM CERRUTI pant suits are available with 4 different breasts styles, to match with the latest trend. For the styles of lapel, you get shawl lapel and curved notch lapel for an informal pant suit whereas notch lapel & peak lapel give your pant suit a formal look. Finally we come with 3 styles of vent: single centered, dual side and no vent. We feel that our online store is totally for your convenience and you can surely select and design a pant suit for you from this store, and that too full of your own choice. LP14 No pleat trousers alway look clean and slim, but if you need room to move or if you sit in the chair a lot then one or two pleats would make you feel more comfortable. No side pocket trouser make you look slimmer than with the two side pocket, as sometime these pocket do make a gap and bulge up. For further details and style on trouser please contact us.